Florence is considered the capital of the art of the world. Many of the great masterpieces, especially from the important Renaissance period, are exhibited in the museums of Florence. 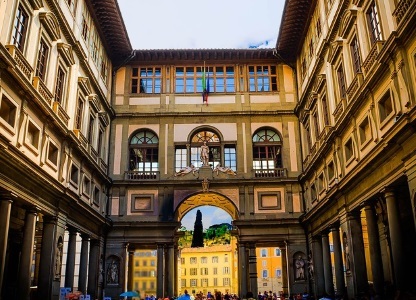 The two major museums Uffizi Florence and Galerie Accademia are among the top 10 art museums in the world. But there are many more art museums and other museums in Florence (over 100). Now an overview of the major museums in Florence, ordered by importance from our point of view. One of the largest art museums in Europe and the most important museum in Florence. With over 5,000 visitors per day on average (many more in summer) it is the most visited museum in Florence. The exhibition in the city centre is particularly well known for Renaissance paintings. You should definitely buy your tickets on the Internet, as the queues at the entrance are often extremely long. The second big museum in Florence. 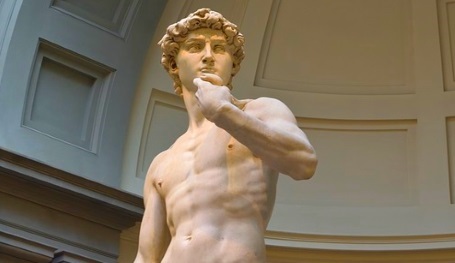 Here is the most famous sculpture in the world, the David by Michelangelo. Many visitors come to the museum Accademia only because of this one work of art. Here, too, many visitors, hundreds of metres long queues at the entrance, i.e. buying tickets in advance on the Internet and passing by the queue. A magnificent museum next to one of the most famous churches in the world. In the cathedral museum many works of art from the well-known cathedral church are exhibited. One of the highlights are the famous golden doors from the Baptistery of the Florentine Cathedral. The cathedral’s museum was extensively modernised and enlarged a few years ago. Absolutely visit! The third large art museum in downtown Florence. In old palace Bargello is mainly known for world famous sculptures. This museum is also a „must“ on a city trip to Florence. In the gigantic palast Palazzo Pitti are several museums. It is on the other side of the river Arno, seen from the city centre. It is only a 15 minute walk from the centre of Florence. The most important museum in the palace Pitti is the grandiose collection of paintings Palatina with many pictures, among others of Rubens and Rafael. But also a famous gallery for modern art is in the palace, beside it a museum for silver, a museum for costumes and some more. The Palazzo Vecchio was for a long time the power centre of Florence, directly in the city centre. Worth seeing is the interior of the building and the art exhibited there. The highlight is the large hall of the 500, one of the largest medieval rooms in the world. You can also climb the high tower of the Vecchio Palace. A museum about Galileo Galilei and natural sciences such as physics, astronomy and chemistry. One learns that Florence was not only an important city in art, but also in science. Good, modern, interactive and multimedia exhibition in the city centre near river Arno and museum Uffizi. A small but worth seeing museum, which mainly deals with replicas of inventions of Leonardo da Vinci. Also interesting for children, only 200 meters from the cathedral of Florence. There are of course many other museums in the city of art and museum Florence. In total, there should be about 120 museums in the city at the Arno. There are many museums in the city centre. The museums described above are all within 20 minutes walking distance of each other.